Favorite Sports/Activities/Pastime: Surfing, kayaking, Sailing, running on any beach, making sure he is covered in sand, cuddling in bed, playing with Ruby our cat & his poodle girlfriend Lily. 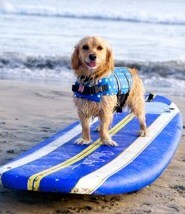 JW is looking forward to learning how to surf better this summer! Favorite Food: Anything he can get hie paws on!!! JW was adopted 1-31-11 when we were at the 1st Pet expo in Del Mar, CA. My friend Cate with Shelter Dogs to Dream Dogs had a few dogs up for adoption that day. There he was, all curled up in a ball sleeping while all the other dogs were barking. He looked like a golden puppy until he stood up & had a doxie body & legs. That’s all it took for me……..& JW went home with us.